Are you mad for plaid and burly beards? So. Are. We. When the leaves turn brown and the first frosts fall, beards start appearing on faces as a practical winter wardrobe upgrade. They are basically built in face warmers, and most women can only admire this skill. But when it comes to fashion, nothing coordinates better with a beard than good old-fashioned plaid. This trendy textile is something any gender can enjoy! Talk a bout a classic fabric, plaid never really goes out of style. The woven bars of plaid patterns may change color and size, but when the temperatures drop our inner lumberjack comes out. Buffalo Check plaid and Royal Stewart Tartan plaid take over our winter weather wardrobes and also our party themes! 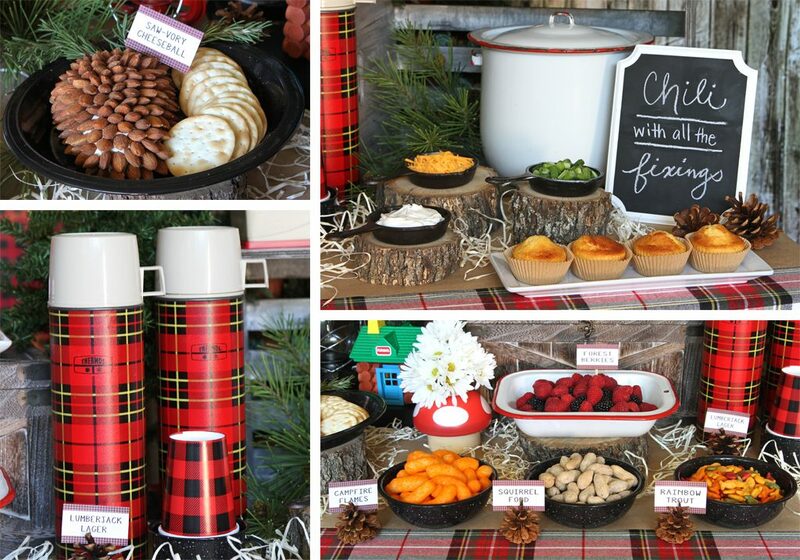 Cozy up with a mug of hot cocoa, pop on a few extra marshmallows and get inspired by our Lumberjack Bash! 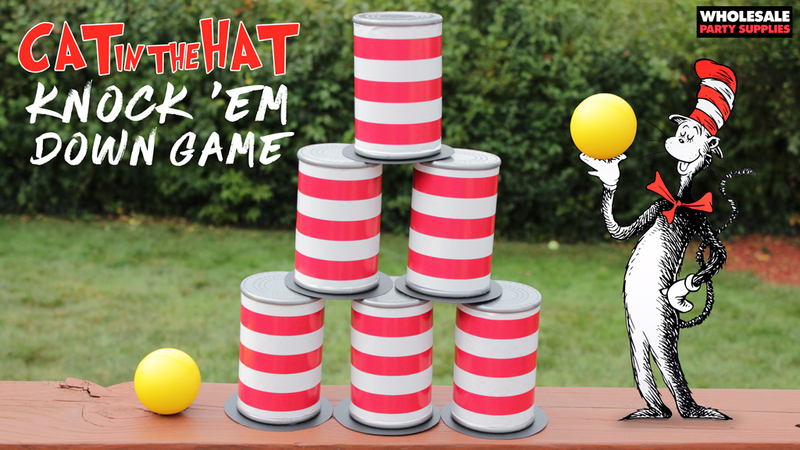 We piled up plenty of iconic and fresh ideas sure to make all your guests yell “TIMBER!”. 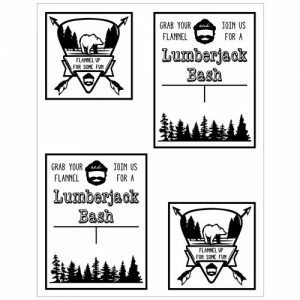 Constructing these invitations is “saw” easy when you download and print the PDFs below. 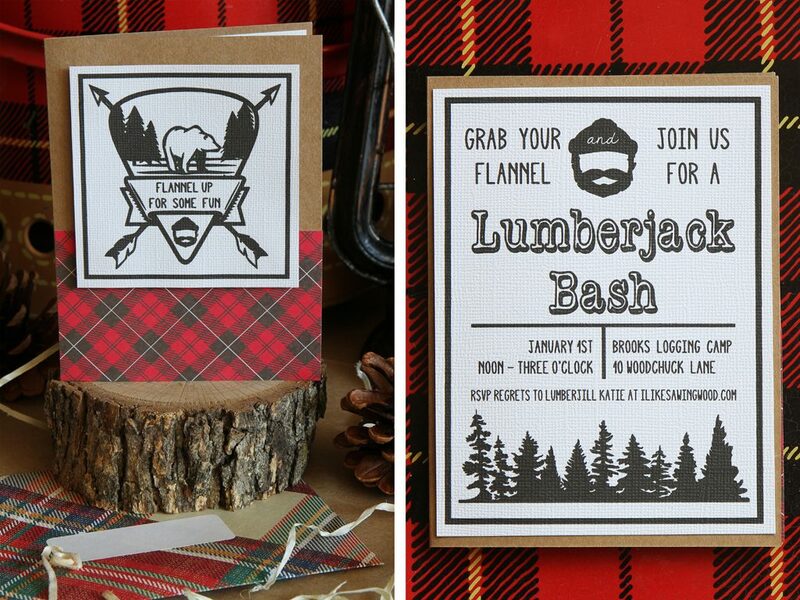 Further the plaid-o-palooza by slipping invites into plaid envelopes made from pattern paper. Click to each of the images below to download the printable. Welcome guests with a twist on the traditional wreath. Use a pair of children’s suspenders to hang the door sign from a plastic prop ax. 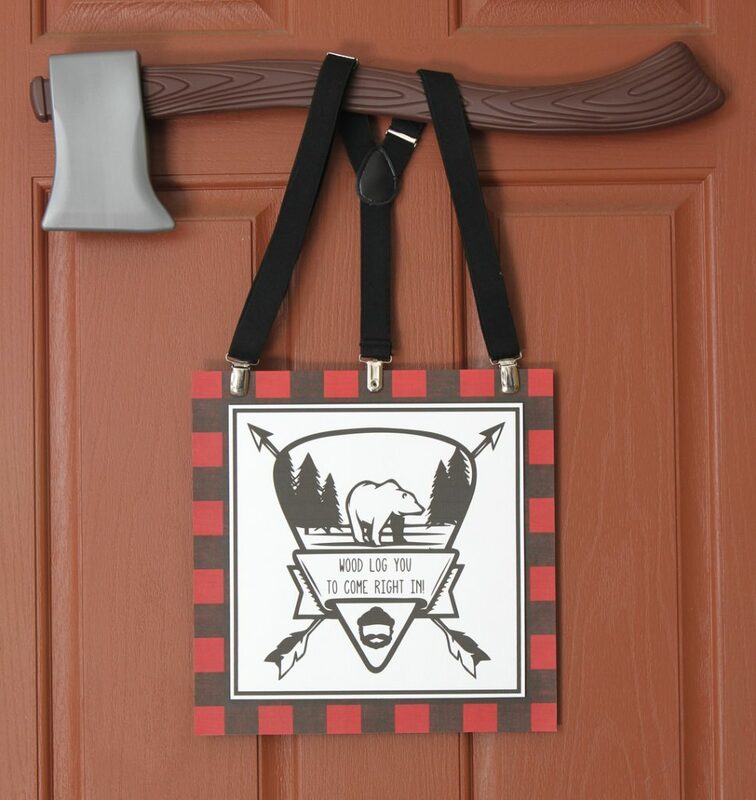 Back the sign with a buffalo plaid print for more impact and simply attach the ax with damage-free wall strips. 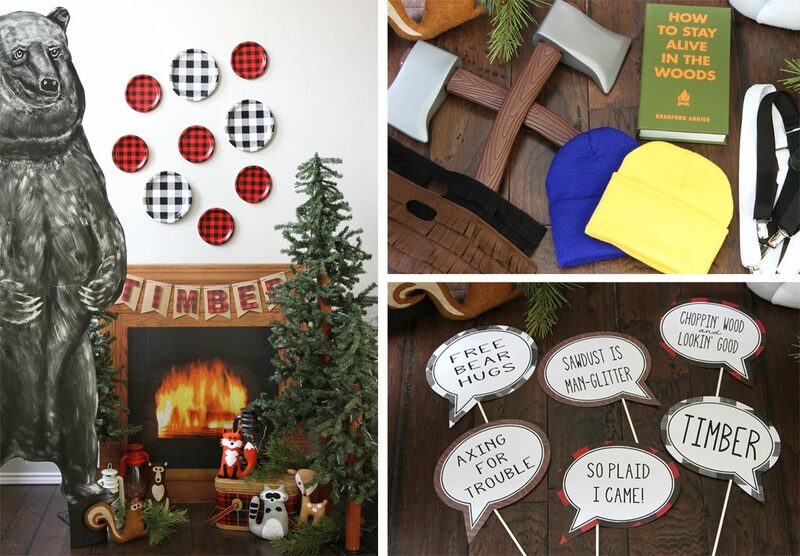 Gather all things woodsy and rustic then combine them with all things plaid for that true logging camp atmosphere. 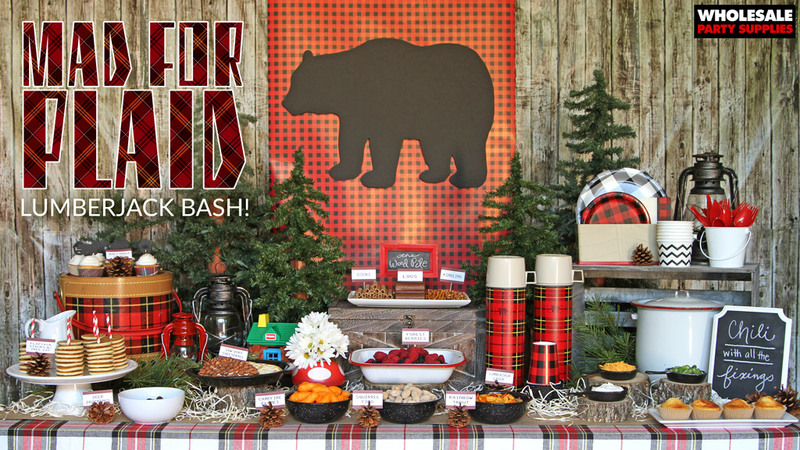 Start with this Barn Siding Backdrop then add some buffalo plaid wrapping paper. Finish with a large black bear cut from foam core. Layer the tabletop with plaid upon plaid. We ruffled a few Lumberjack Plaid Table Covers then topped them with some cozy flannel and a kraft paper runner. To mimic wood shavings, spread some wood-excelsior shred all around. 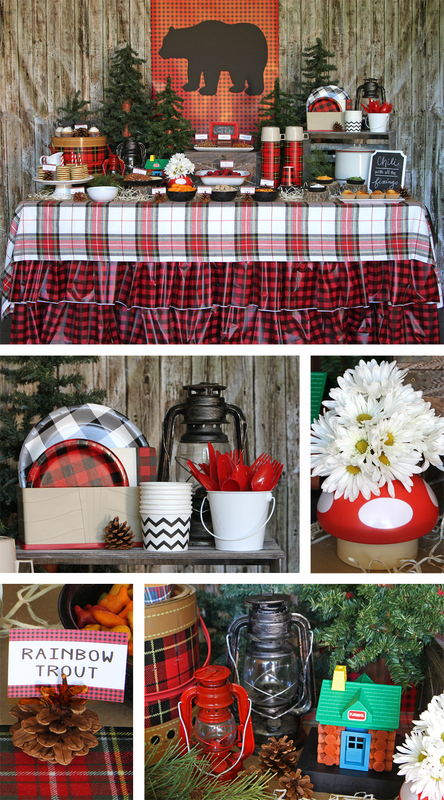 Set Lumberjack Plaid Tableware, Chevron Treat Cups and Solid Red Utensils atop a wooden crate for easy access. Transform Mushroom Molded Cups into quirky and unique flower vases. Pinecones make perfect food label holders. 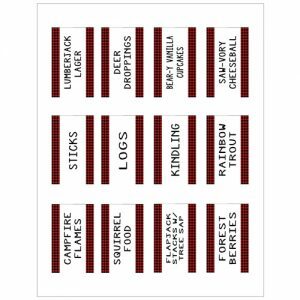 Get all our plaid food labels here. Couple a few of our Old Lanterns with vintage ones for even more logging camp charm. 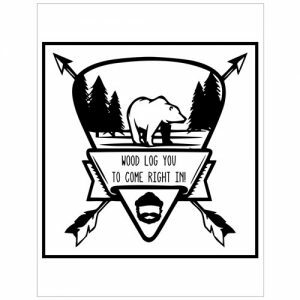 Nothing says lumberjack more than a cabin built of Lincoln Logs. 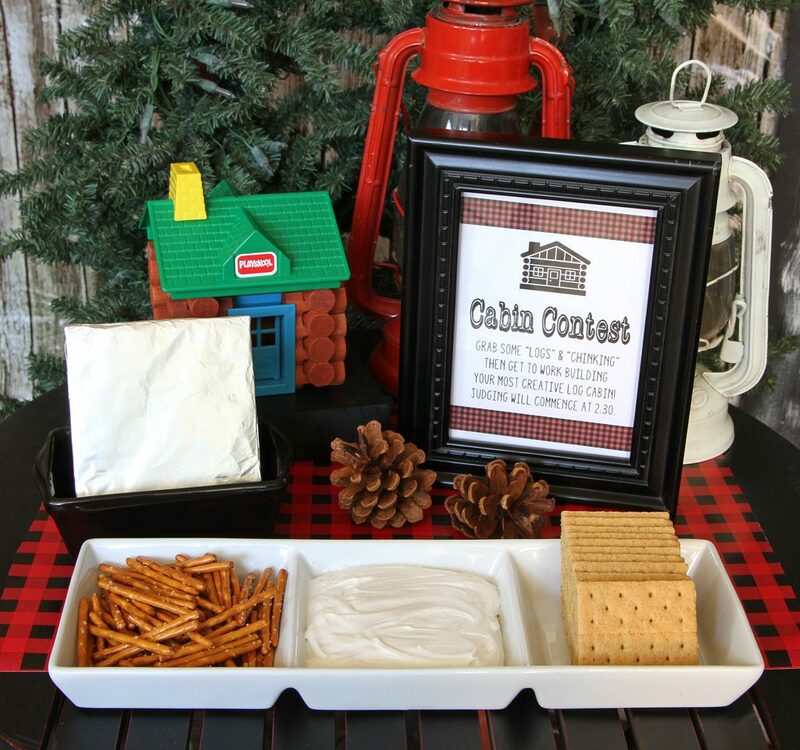 Feed rugged and burly lumberjacks with a chili bar and a myriad of thematically clever snacks. Serve everything up in vintage enamelware, Thermoses and mini-cast iron skillets. 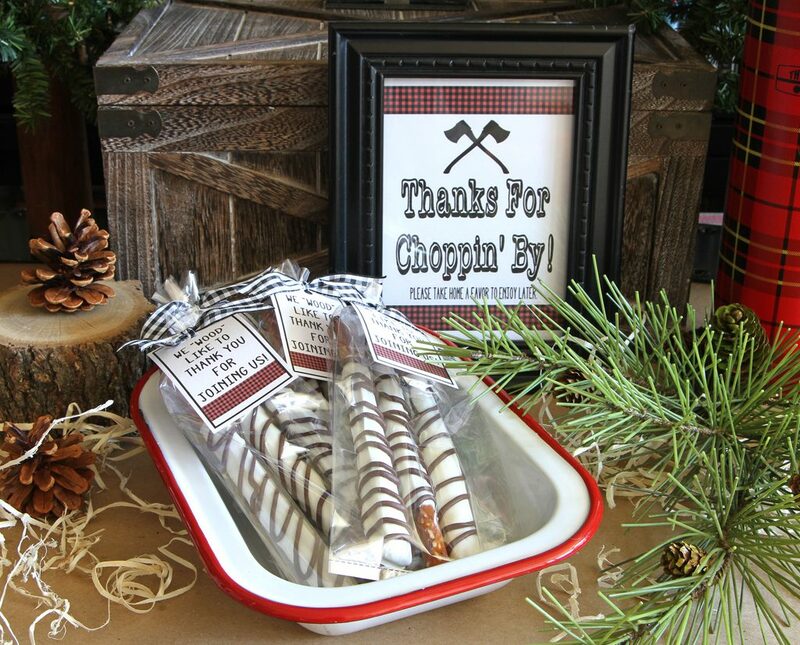 Sweeten things up with a “Wood Pile” full of sticks, logs and kindling … aka Pirouette cookies, Swiss cake rolls and pretzels. 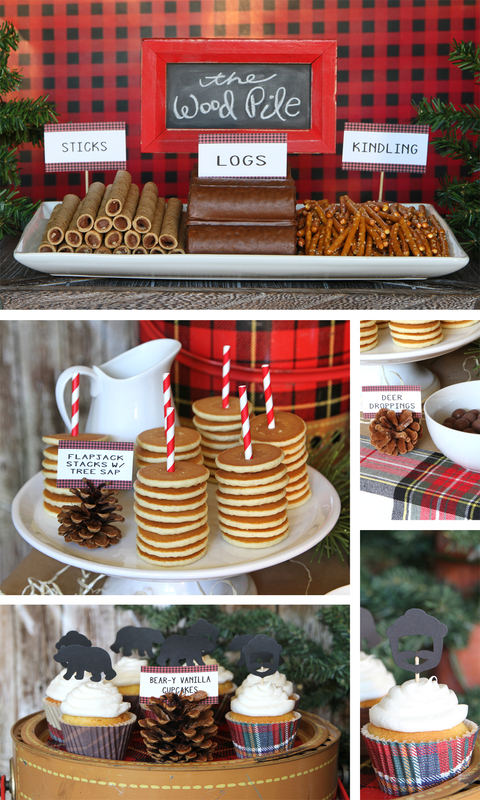 Stacks of mini-pancakes skewered on Red Striped Paper Straws add another lumberjack touch. Make sure to offer maple “tree sap” syrup for dipping. Set cupcakes in wood grain and plaid paper wraps then add hand-cut bear and beard cupcake toppers. 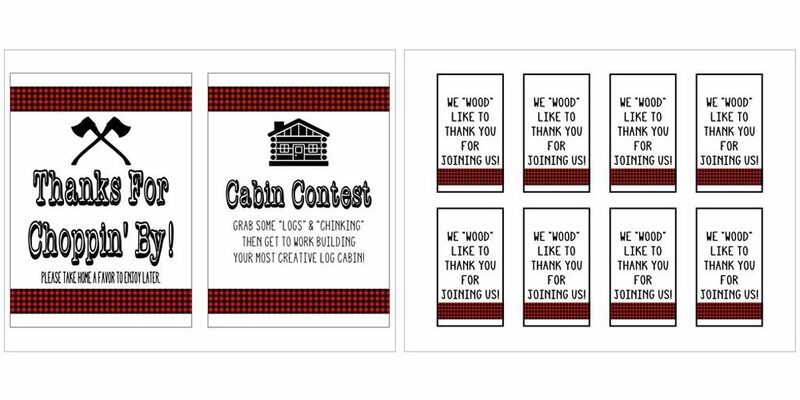 Put your guests’ construction skills to the test with a cabin building contest. Provide all the needed materials such as logs (pretzels), chinking (vanilla frosting), walls (graham crackers) and a foundation (foil covered cardboard). Create a cozy photo booth corner for guests to pose and pretend in. Set the scene with a Fireplace Standup. To the fireplace, add a Kraft Pennant Banner embellished with plaid letters made from Lumberjack Plaid Beverage Napkins and chipboard. See tutorial for that banner here. Lumberjack Plaid Plates attached to the wall above the fireplace add even more realism to the scene. 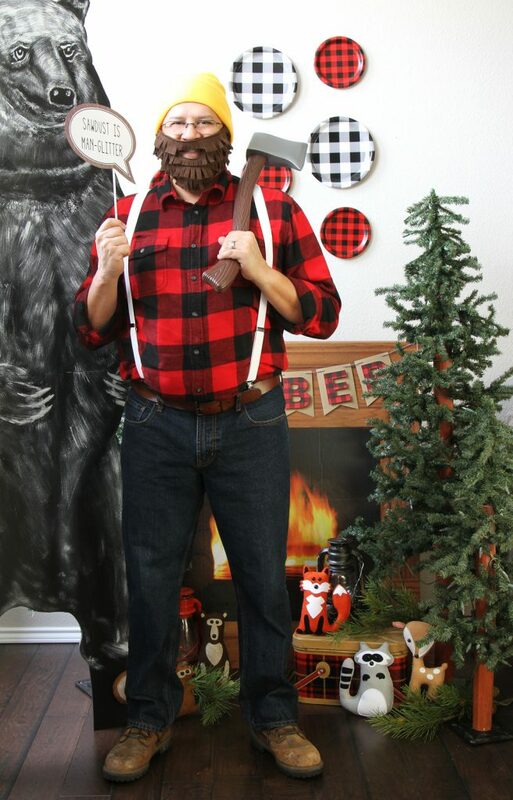 Provide guests with plenty of props such as Plastic Axes, beards, hats and suspenders. Let your guests choose the perfect quote bubble to match their mood. Print and cut out your witty quotes and back bubbles with pattern paper then add lollipop sticks for easy holding. Once guests are all dressed up, have them stand with a giant DIY bear for their photo op. We taped two large black foam core boards together then projected a clipart image onto it. A little white paint and some smooth moves with a craft knife finish the effect. When all the sawing’s done, send guests home with a bag full of birch pretzel logs. Top bags with clever tags and a plaid ribbon tie. Grab the tags and frame insert here. Connect with us on Facebook, Twitter, and Instagram if you like to party like we do!